Line a baking sheet with aluminum foil, and spray with non-stick cooking spray. Coat a small saucepan with non-stick cooking spray. Over medium heat, cook and stir garlic until soft, about 3 minutes. Mix in white wine, SANE honey, balsamic vinegar, mustard, and salt and pepper. Simmer, uncovered, for about 3 minutes, or until slightly thickened. 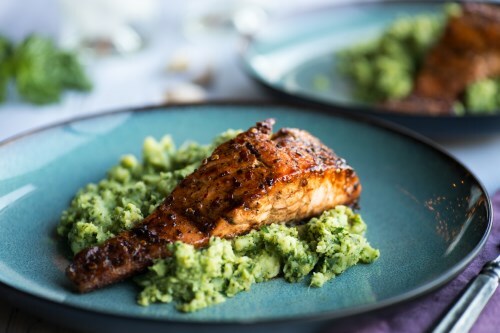 Arrange salmon fillets on foil-lined baking sheet. Brush fillets with balsamic glaze, and sprinkle with oregano. Bake in preheated oven for 10 to 14 minutes, or until flesh flakes easily with a fork. Brush fillets with remaining glaze, and season with salt and pepper. Use a spatula to transfer fillets to serving platter, leaving the skin behind on the foil.